NEW YORK (CNNMoney.com) -- Cars and SUVs don't stand bumper-to-bumper. That mismatch can turn what would have been minor rear-enders into massive repair bills for both vehicles if they crash, according to a new report from the Insurance Institute for Highway Safety. The Insurance Institute, a private group financed by insurance companies, blames the divergence on what it calls a "long-standing gap" in federal auto safety regulations. "SUVs and cars share the road," said Joe Nolan, the Institute's chief administrative officer. "The problem is they don't share the same bumper rules, and consumers end up paying the price." Federal rules require cars to have bumpers that protect an area between 16 and 20 inches from the ground. That means when cars crash into each other, they at least tend to hit bumper-to-bumper. But there are no such rules for trucks and SUVs. Bumpers for SUVs, even car-based crossover SUVs, are often high in the air where car bumpers can pass underneath them. That leads to expensive damage. To see how bad the damage could be, the Institute conducted low-speed crash tests, running SUVs and small cars into each other at 10 miles per hour. Seven pairs of vehicles -- one SUV and one small car from each of seven manufacturers -- were bumped into each other. In each case, the SUV was driven into the back of the car at 10 miles per hour, then the opposite was done and the car was banged into the back of the SUV. "We picked vehicles from the same manufacturer because we think automakers should at least pay attention to bumper compatibility across their own fleets," Nolan said in an announcement. "The results show many don't." 0:00 /2:10A $64,500 Hyundai ... Really. 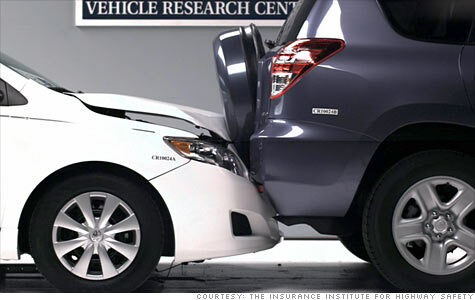 Total damage estimates ranged from $2,995 caused when a Honda CR-V SUV rear-ended a Honda Civic ($1,721 for the Civic, $1,274 for the SUV) up to $9,867 in damage caused when a Toyota Corolla hit a Toyota Rav4 from behind ($3,852 for the Corolla, $6,015 for the SUV). In some cases, significant damage resulted from things like broken radiators and cooling fans as cars plowed under SUVs or SUVs rode up over car trunks. And the bigger vehicle didn't always win. In the case of the Toyota Corolla rear-ending a Rav4, the SUV suffered the more expansive damage. The Insurance Institute blamed a weak rear bumper on the Rav4 which allowed the car to hit the SUV's tailgate-mounted spare tire. That caused major damage to the Rav4's tailgate and rear body panels. Honda vehicles came through better than its rivals because their bumpers matched up better than most, the Insurance Institute said. Even there, the damage -- at almost $3,000 -- was worse than it should have been, the Institute said. "Of the seven car-SUV pairs we tested, we can't point to a single one as a model of compatibility because combined damage estimates ran into the thousands of dollars even for the best performances," Nolan said. Part of the problem is that bumpers on most vehicles today are weaker than they should be, said Institute spokesman Russ Rader. On cars, bumpers were once required to withstand five mile-per-hour impacts, Rader said, but those rules were weakened in the 1980s. Today, they're required to withstand impacts at just half that speed. For SUVs, there are no regulations on bumper height or performance. The National Highway Traffic Safety Administration disagrees that today's weaker bumpers have led to higher crash costs. The change in regulations caused only a slight increase in vehicle repair costs, according to NHTSA's Web site, and that has been offset by the lower costs of the bumpers themselves. The Insurance Institute requested in 2008 that NHTSA regulate truck and SUV bumpers the same as those of cars. On its Web site, NHTSA says it has chosen not to regulate bumpers on SUVs or trucks because of concerns that regulations could compromise the vehicles' functionality or off-road performance. NHTSA accepted public comments on the matter through August of 2009 and will decide whether to regulate SUV bumpers once it has finished reviewing those comments and other data, a NHTSA spokesman said.